What is the measure of a man? Is it how is he judged, remembered and regarded by others? Or could it be through his words, deeds and actions? Is it a combination of his life’s achievements? His heart? His soul? His intellect perhaps? These questions have never been posed more eloquently, or thoughtfully than in the terrifying events that play out in Mary Shelley’s ‘Frankenstein’; and few adaptations of her story have managed to capture the imagination, spirit and essence of her tale in quite the same way as this stunning dramatization. There are, I’m sure few, if any, individuals unfamiliar with the story of Victor Frankenstein; his unrelenting obsession to challenge death, his unsated appetite to create life and his pursuit of both through the creation of his “creature” and the devastation that is ultimately wreaked on his own life and the lives of all those he loves as result of his hubris. It’s a tale told often, reaching into the core of the human condition, and one that never loses its impact; its central themes resonating as loudly today as they did when it was first published in 1823. 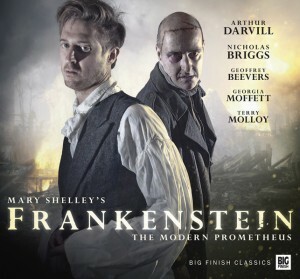 While ‘Frankenstein’ has been adapted many times, a scant few of these versions have managed to capture the raw power that bubbles underneath – and finally breaks through – the surface of the story; but this latest dramatic production of the myth pushes its way to forefront taking its rightful place amongst the best of them. Succeeding, where so many fail to slowly and horrifyingly reveal it’s frightening, beguiling plot weaving its web as the players become caught and ensnared in its threads.